Adding a dry riverbed to your landscape provides an appealing aesthetic detail for some. Many homeowners build dry riverbeds to provide drainage in their yards where water may accumulate as the result of poor location or improper excavating after construction. Dry riverbeds are also clever landscaping solutions for undesirable ditches or valleys in the middle of lawns. River rock is relatively inexpensive or can be free if you happen to live near a river or creek. 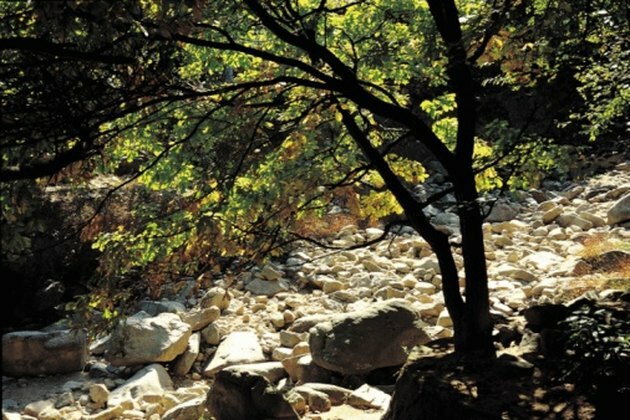 Making a dry riverbed landscape can help solve drainage problems in your yard. Determine if you need to account for slope in the riverbed, which is required if you want the riverbed to provide drainage for your yard. Determine the best place for the riverbed to end and deposit the drained water, such as in an unused corner of your yard. Draw the plan for the dry riverbed on graph paper, making sure to measure it to scale with your landscape. This will let you experiment with the width and curves in the riverbed before you begin the work. Clear the general area of grass and other vegetation by digging with the shovel. Clear a larger area than the planned riverbed to account for the addition of landscaping plants. Paint the shape of the riverbed with landscaper's paint. You could also mark the shape with a shovel tip or small stones. Dig out the area for the riverbed with a shovel; a good size would be about 3 feet wide and 1 1/2 feet deep. If you will be adding the riverbed in a natural valley within your yard, there is no digging necessary beyond removing the vegetation and creating bends, if desired. Cover the soil in the riverbed with landscaping fabric or mulch to prevent weeds from growing among the rocks. Outline the border of the riverbed with large river rocks, staggering them so their placement seems natural. Fill in the riverbed with river rocks over various sizes, including boulders and polished pebbles. You might even add a piece of driftwood to make the riverbed more authentic. Add landscaping options such as plants, a bench or a walking bridge to accentuate the dry riverbed.